Threats can take place from both internal and external users’ therefore monitoring every minute detail of user activity is very crucial to mitigate threats. Most major data breaches have happened because organizations have failed to monitor the session activities of their users, especially users who have privileged rights (Internal Users). IT security professionals need to rely on user audit trails to help them in gaining security intelligence about the activity of users on the enterprise network system. If a hacker does make it to one of your machines, the user audit trail will be the most valuable information that will help during the log forensics investigation process and provide a complete activity timeline of what the hacker did, from login to logout. EventLog Analyzer’s real-time user session monitoring capability, helps in detecting system and data misuse by tracking the user activity on the network. It monitors all users in real time and provides exhaustive reports with a complete audit trail of all user activities that happened from the moment the user logs-in and log-outs. With the EventLog Analyzer, IT security professionals get precise information in real time on critical events such as user logons, user logoffs, failed logons, successful audit logs cleared, audit policy changes, objects accessed, user account changes, etc. IT security professionals can now monitor and analyze the session activity user audit trails of network users in an enterprise to detect malicious activities and security violations in real-time. 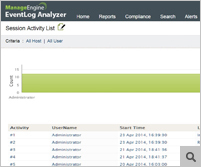 EventLog Analyzer’s audit trail monitoring makes it possible to ascertain which user made the anomaly, whether it was the internal user or an external attacker. EventLog Analyzer also generates privileged user monitoring and auditing (PUMA) reports by tracking the activity of privileged users. Complete User Audit Trail – Get a complete timeline of all user activities for establishing what events occurred and who caused them. User audit trail answers the 'who, what, when, where, and how' of all network activity. Reconstruction of the network incident – Pinpoint how, when, and why the network problem occurred by reconstructing the entire network incident by analyzing the user activity timeline. Proactive Threat Detection – Detects and analyzes the behavioral pattern of malicious users in real-time thereby preventing them from gaining unauthorized access to your critical network assets.